Well, bad news, folks. It’s never different, not this time, not anytime, NEVER. They have magicked-up 100s of trillions in debt and guarantees while the US Federal Reserve has gobbled up over 90 percent of the US mortgage market. Global stock market valuations are buoyed by stock buybacks, funded by record corporate debt, and enabled by reckless central bank zero-interest-rate policies. Pay no attention to the fact that in the past few years, US stock indices have surged over 70 percent to new all-time highs while profits have only risen an anemic 2 percent. Today’s record amount of corporate debt is cannibalizing corporations by bringing future earnings forward which makes future stagnation and collapse into bankruptcy a certainty. For the near term, CEOs will continue to receive record pay packets for out-preforming the market as their stock prices bubble like a rocket ship into outer space while these actions decimate any long-term growth prospects. So, what led to history’s biggest financial crisis in 2006? Too much debt, credit, and leverage—proving that Fed Chair Ben Bernanke was dead wrong. What did we learn? Nothing, a big fat zero. In fact, property prices have recently eclipsed previous 2006 highs, bubbling to frothy new all-time highs while real wages declined and high-paying jobs have disappeared. Real estate is an asset but not an asset class because it lacks liquidity. It takes time to sell property and the difference between what a buyer is willing to pay and what a seller is willing to sell for may be HUGE. For example, a buyer may be willing to pay $750,000, but the seller will only sell at $900,000. In good times, frenzied buyers create “bidding wars” on coveted properties sometimes rocketing the price 30 percent above the original offer. This is terrific if you are a property owner or property seller, but not so much if you are a first-time buyer. In bad times, prices collapse and the only price a buyer is willing to pay for the $900,000 home above is $90,000. Great for buyers, but not so great for the owner who holds a mortgage of $700,000 that must be repaid to a bank. During these BOOM times, optimism bias creeps into the minds of buyers allowing them to pay off the charts, wildly inflated, irrational prices for fear of “missing out.” Optimism bias is a cognitive bias that causes a person to (mistakenly) believe nothing negative could ever happen to them. It is a “close your eyes and buy at new all-time highs” belief system. If the prices collapse, the banks can require more capital. If you do not have more capital, the bank can take your property. If the government wants to increase your taxes, you must pay or they will confiscate your property. In fact, property confiscations are already happening in Greece and Italy. Commercial and residential real estate are now grotesque asset bubbles ready to explode. 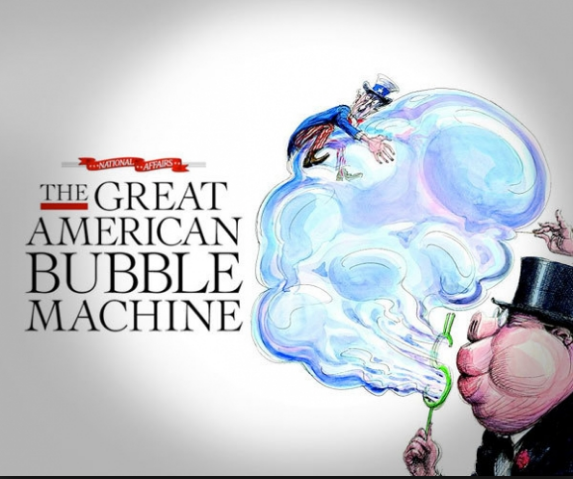 Why are these asset bubbles continuing to grow? The blame can be placed on the central banks. They are destroying natural market pricing mechanisms (i.e., capitalism) by engaging in currency and stock manipulation. They are purchasing massive amounts of corporate debt as well as selling off their local currency and buying US stocks denominated in US dollars. This pushes down their local currency, making their exports more attractive, and increases the US dollar stock price allowing the central bank to make a tidy profit on their long US stock and long USD positions. The Swiss National Bank, the Bank of Japan, and the People’s Bank of China are buying massive amounts of stocks. This currency and stock manipulation is crushing the emerging markets, especially countries that have debt in US dollars. Since 2013, the value of India’s rupee has depreciated 30 percent Vs. US dollars and the value of Mexico’s peso has depreciated 65 percent Vs. US dollars. In 2015, Brazil’s currency plummeted over 60 percent and Venezuela’s bolivar has been obliterated. And it’s not just emerging markets. Between 2008 and 2009, the value of Great Britain’s pound (GBP) plummeted by over 30 percent Vs. US dollars, and in 2014 the Euro lost 25 percent of its value against the US dollar. The central banks’ policies of asset inflation, money printing, currency manipulation, and most importantly exporting inflation to the emerging markets are to blame for these currency wars but the financial media’s propaganda bullhorn would rather blame BREXIT, Trump, or Putin for these losses. The central banks’ monetary policies have only succeeded in creating the most debt in history while enabling irrational valuations in commercial and residential real estate as well as in the stock and bond markets. Monetary policy has failed to create economic growth and the unintended consequences of these actions have sparked an epic currency war destroying emerging markets with excessive US dollar debt and debased currencies. The currency wars and exporting inflation are the elephants in the room that no one is talking about. This will lead to trade wars and end with a catastrophic global financial crisis or, even worse, a world war. Interesting article and I agree with the premise HOWEVER ‘more debt is good’ is NOT ‘Keynesian’. Keynes’ idea was that – sensibly – countries should tax prosperity to save in the good times to spend in the bad. Excellent idea. Sadly, those who don’t like paying tax – the rich (although we apparently as instructed by the right-wing media must refer to them now as the ‘wealth creators’) – have spent a lot of time and money making sure this doesn’t happen. One of the ways they have done this is to equate Keynesian ideas with communism/socialism; it’s been very effective, as we now find out as we have austerity measures imposed whilst trillions of dollars of speculative cash circles the globe untaxed every single hour of every single day doing nothing but seeking more unneeded cash. Speaking from the White House podium press secretary Sean Spicer quoted at length from a Fox News report, which alleged Obama had used GCHQ to dodge US legal restrictions on monitoring US citizens. In a series of tweets on March 4, Trump accused Obama of a “Nixon/Watergate”-like plot that would almost certainly break US law. “Terrible! Just found out that Obama had my ‘wires tapped’ in Trump Tower just before the victory. Nothing found. This is McCarthyism!” one tweet read. Members of Congress from both parties who are investigating the claims have found no evidence to support them. In the Fox report — which came almost two weeks later — Andrew Napolitano claimed that “three intelligence sources have informed Fox News that President Obama went outside the chain of command” to order the tap. “He didn’t use the NSA, he didn’t use the CIA, he didn’t use the FBI, and he didn’t use the Department of Justice,” Napolitano said, adding that Obama used GCHQ. Spicer’s citation, in front of the White House seal, raised some eyebrows in London and at the Cheltenham-headquartered agency, which has worked closely with US intelligence for decades. “Recent allegations made by media commentator Judge Andrew Napolitano about GCHQ being asked to conduct ‘wire tapping’ against the then president-elect are nonsense,” one GCHQ spokesperson told AFP. Britain and the United States are — along with Australia, Canada and New Zealand — part of the “Five Eyes” intelligence sharing alliance forged from the embers of World War II.